Walking through the side door entry way of our home, I enter a place of solace for me. My laundry room is my happy place. A place to escape the reality of day to day life as a mom, chauffeur, nurse, teacher, chef, accountant…you know the drill. Neatly organized with touches of yard sale decor that I have found for pennies on the dollar, organized baskets that fit perfectly under my DIY shelf, and beautiful glass jars display the laundry soap that send sweet smells of fresh spring, which permeate the living space. Fresh flowers cut daily from either my herb or long stemmed flower garden grace the neatly organized laundry room counters. Right now, this is my reality! 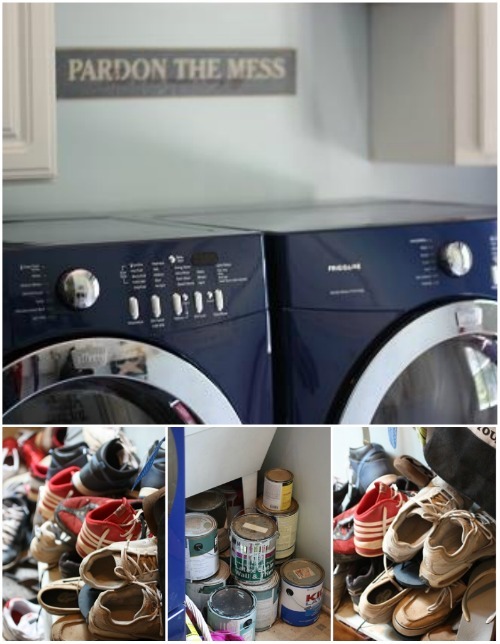 Because even though last year, I did redo a laundry room makeover, and am always amazed at what a little paint does for the budget, I have no area for cabinets, no place to fold the clothes, and I have not managed to figure out a way to conquer the Crazy Amount of shoe shoveling I have to do to find my own. So I am attempting to embrace this season because I know that soon enough, I won’t have cute little girl clothes to fold, or football clothes that smell. 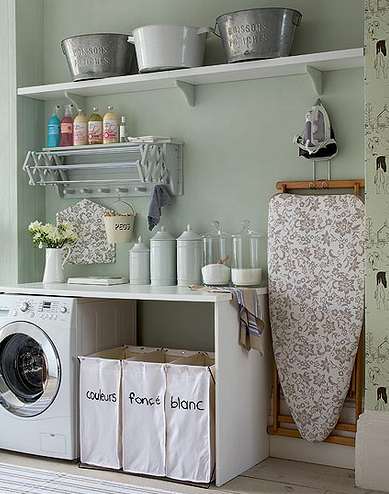 Those laundry rooms are so beautiful! I redid mine a few years ago and it made me so happy, but it does still get to be a cluttered mess at times. My mountain of shoes are piling up in a Rubbermaid tote. So at least they are contained, but a mountain nonetheless. Yes, my laundry room is a mess, too. It’s a basement laundry room. But we also have a chest freezer in that laundry room and our extra food pantry, which is a Rubbermaid plastic cabinet. Plus, there is a mountain of leftover winter hats and gloves still waiting to be washed down there. Sigh! And, winter boots are still floating around there waiting to be neatly put away. Oh wait … never mind. The snow in NY will be here in a few short weeks anyway. LOL. Thanks for keeping it real Jen! 🙂 That’s why I love your blog so much. I don’t feel like such a domestic failure, especially in a house full of teens and tweens. One of the first things we did when we moved into this house was organized and “beautify” my laundry room. I love it! It is not a large space, so we stacked the washer and dryer (front loader), and built a shelf to hold 2 laundry baskets with 2 under it. I even color coded the baskets (blue for darks, pink for reds, white for whites, and green for towels). My kids have zero excuse for not putting the clothes in the appropriate basket. 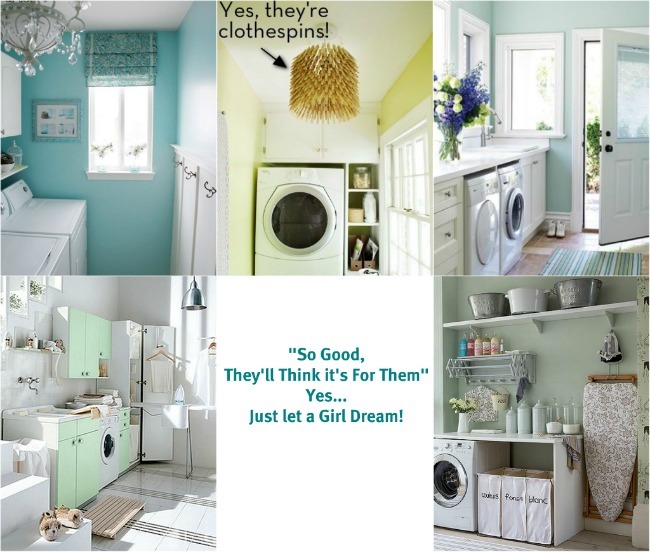 Having my laundry room pretty (well, not “magazine” pretty, but you know) and organized makes the nightmare of washing clothes for 5 kiddos a little less scary. Man, you really had me going there, and envious. I hear you about appreciating the messes while your kids are still home to make them, but sometimes I have to have a little talk with myself about it. . .
Ha ha ha … I was like Wow!! You got me!! I wish I had your great attitude when my kids were younger. I’m glad you guys spoke about that at Becoming!! Thanks for all your hard work putting the conference together! Too funny! I was sitting here wondering what on earth I could do with my laundry area, which is in a musty, unfinished basement, and wishful thinking was taking over. Then insert the reality part, which is probably mostly everyone’s reality – at least part of the time – and the down to earth part of ‘this won’t last forever.’ I can tell you from experience that it won’t last, both of my sons are grown and live in different states now, so enjoy even the day to day work caused by having children, because I really miss that empty Mountain Dew can in the living room, and mountain of clothes on the floor (my youngest’s storage system) in the boy’s room. Those are the things that told me the boys were home… thanks for the laugh and memories! That’s funny. I was thinking, “She didn’t tell us she had a cut flower garden.” Now I know why. Our laundry room gets like that also. 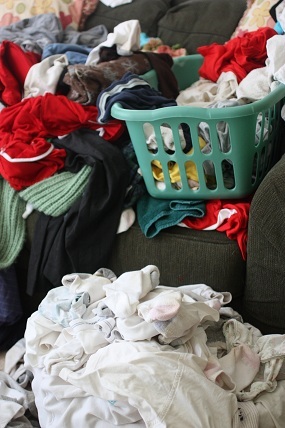 We’ve been hanging our laundry this summer and believe it or not, it has helped with the mess. Now, how long we can continue once we get in full swing for school? I have no idea.